Sometimes I ask the carnivore to pick up an item or two from the grocery store on his way home. I know this means a couple of things. First, I can bank on him coming home with at least three things I didn't know existed much less asked for (think pretzel ice cream cones). It also means, I will likely get at least one phone call from him at the store with a question of something that seems obvious to me (like, do we need pretzel ice cream cones - um, no). So, the other day I asked the carnivore to get a few pears so I could make baby omnivore some purees. I never thought he would go to Costco and get me a million pears. 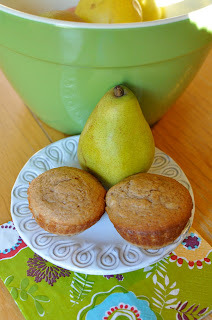 Oh well, time to find something to do with the rest of those pears...how bout muffins? Preheat oven to 350 degrees. Grease your muffin pan. Mix together the dry ingredients in a bowl. In your mixer add in your wet ingredients and mix slowly. Fold in the dry ingredients. Finally, toss in the pears and mix thoroughly. Fill muffin cups 2/3 full. Bake for about 20 minutes til golden brown. Let cool in the pan for 5 minutes. Transfer to a cooling rack and continue to cool for about 10 minutes. Enjoy while warm. 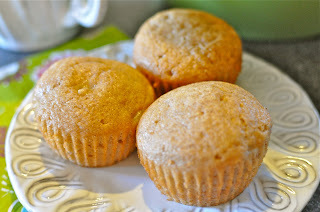 This should yield about 18 muffins. This isn't exactly what I had in mind when I asked for pears, but my better half and his strange shopping habits made for a perfect breakfast for both of us. We are quite a pair! These sound so good! 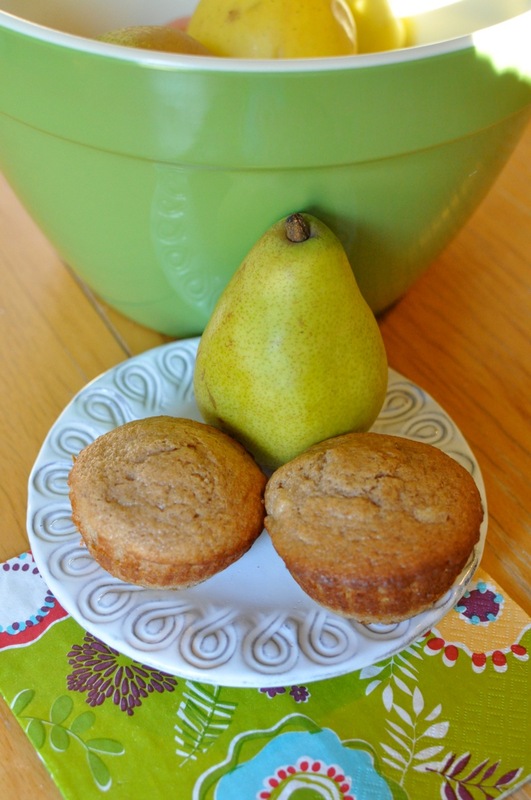 I love pears but I've never had pear muffins before! I'll give them a try.